HIROHITO AGREES TO WAR WITH U.S. Early in September 1941 Japanese officials gave their diplo­mats until Octo­ber to reverse the policy of the West­ern powers—prin­ci­pally the U.S., Great Britain, and the Nether­lands—of restricting Japan’s access to vital South­east Asian resources, among them oil, rubber, tin, tim­ber, and rice. The restric­tions had been im­posed the pre­vious month after Japan had stationed troops in Vichy French Indo­china. For its part, the U.S. had frozen Japa­nese assets in the U.S. and embar­goed oil and gaso­line exports to Japan. At an Im­perial Con­fer­ence of Japa­nese offi­cials (Gozen Kaigi) attended by Shōwa Emperor Hiro­hito on this date in 1941, Gen. Hideki Tōjō—war min­is­ter, home min­is­ter, and since Octo­ber 17 prime min­is­ter as well—said Japan must be pre­pared to go to war with the West, with the time for mili­tary action ten­ta­tively set for Decem­ber 1 if diplo­macy with the U.S. and Euro­pean colo­nial powers failed to im­prove rela­tions and reverse trade sanc­tions. The Japa­nese foreign min­is­ter didn’t see that hap­pening, telling the august assem­bly that the pros­pects for diplo­matic suc­cess are, “we most deeply regret, dim.” Hiro­hito, who two days earlier had been briefed about the planned attack on U.S. military installations at Pearl Harbor, Hawaii, readily assented to the oper­a­tions plan for war against the West­ern nations. He held meetings with Tōjō and the mili­tary leader­ship until the end of Novem­ber. Mean­while the Japa­nese Diet (parlia­ment) approved a reso­lu­tion of hos­tility against the U.S. Late that month Kichisa­burō No­mura, Japan’s ambas­sador to Wash­ing­ton, failed to over­come Presi­dent Franklin D. Roose­velt’s in­sis­tence that Japan must with­draw from China and stop its aggres­sive South­east Asian in­cur­sions before the U.S. would resume trade with his coun­try. On Decem­ber 1, another Impe­ri­al Con­fer­ence offi­cially sanc­tioned war against the United States, Great Britain, and the Nether­lands. Con­tin­ued talks in Wash­ing­ton to heal the breach between the two nations were a smoke­screen for Vice-Adm. Chūi­chi Na­gu­mo’s Striking Force (Kido Butai) of six air­craft carriers as they made their way to the Hawai­ian Islands by a little-used route and took up posi­tions on Decem­ber 4, 1941, 250 miles north­west of their des­ig­nated tar­gets: the U.S. Pacific Fleet riding at anchor at Pearl Harbor and U.S. aircraft parked smartly at Hickman Field. 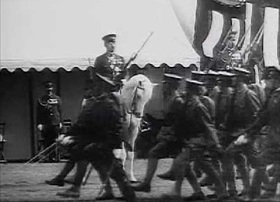 Left: Soldiers parade before Shōwa Emperor Hiro­hito, a revered sym­bol of divine status. While per­petu­ating a cult of reli­gious emperor wor­ship, Hiro­hito also bur­nished his image as a war­rior in photos and news­reels riding Shirayuki (White Snow), his beau­ti­ful white stal­lion. One news agency reported that Hiro­hito made 344 appear­ances on Shirayuki. 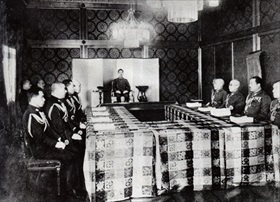 Right: Shōwa Emperor Hirohito, seated in middle, as head of the Imperial Con­ference (Gozen Kaigi), Janu­ary 1, 1945. Convened by the Japa­nese govern­ment in the presence of the Emperor, the Imperial Con­ference was an extra­consti­tutional con­ference that focused on foreign affairs of grave national impor­tance. Hirohito was also a mem­ber of the Imperial General Head­quarters-Govern­ment Liai­son Con­ference. The Liaison Con­ferences coor­dinated the war­time efforts between the Imperial Japa­nese Army and Imperial Japa­nese Navy. In terms of function, it was roughly equi­va­lent to the U.S. Joint Chiefs of Staff. The final decisions of Liai­son Con­ferences were formally dis­closed and approved at Imperial Con­ferences over which the Emperor presided in person. Right: Tōjō in military uniform. 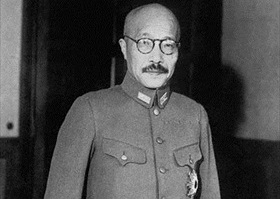 On July 22, 1940, Tōjō was appointed Army Minis­ter. During most of the Pacific War, from Octo­ber 17, 1941 to July 22, 1944, he served as Prime Minis­ter of Japan. In that capa­city he was directly respon­si­ble for the attack on Pearl Harbor. 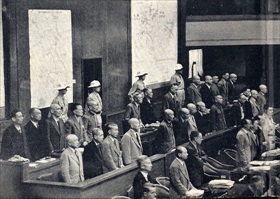 After the war Tōjō was arrested, sen­tenced to death for war crimes during the Tokyo Trials, and was hanged on December 23, 1948.